M. R. Carman, Colarusso, P. D., Nelson, E. P., Grunden, D. W., Wong, M. C., McKenzie, C., Matheson, K., Davidson, J., Fox, S., Neckles, H., Bayley, H., Schott, S., Dijkstra, J. A., and Stewart-Clark, S., “Distribution and Diversity of Tunicates Utilizing Eelgrass as Substrate in the Western North Atlantic: A Latitudinal Study Between N 39° and N 47°”, Management of Biological Invasions, vol. 7. pp. 51-57, 2016. A. Kampia, Klemm, A., Pe'eri, S., Barber, J. E., Merke, D., and Athens, E., “Yukon River Prototype Electronic Charts Using Satellite Derived Bathymetry”, 2016 Canadian Hydrographic Conference. Canadian Hydrographic Association, Halifax, Nova Scotia, Canada, 2016. K. Zwolak, Proctor, A., Zarayskaya, Y., and Wigley, R., “The Shell Ocean Discovery XPRIZE Competition Impact on the Development of Ocean Mapping Possibilities”, Annual of Navigation, vol. 2018(25). pp. 125-136, 2018. G. Masetti and Calder, B. R., “Huddl for description and archive of hydrographic binary data”, Canadian Hydrographic Conference 2014. St. John's, NL, Canada, 2014. B. R. Calder and Masetti, G., “Huddler: a multi-language compiler for automatically generated format-specific data drivers”, U.S. Hydrographic Conference (US HYDRO) 2015. Gaylord Hotel, National Harbor, Maryland, USA, 2015. 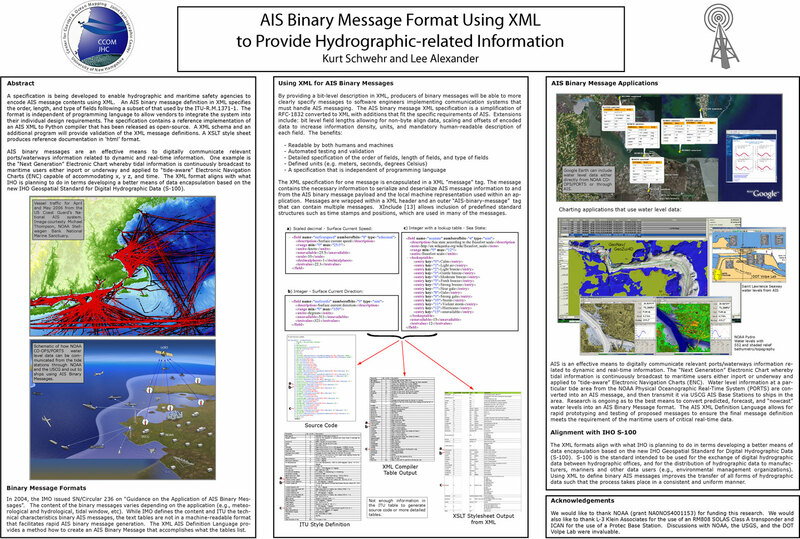 K. Schwehr and Alexander, L., “AIS Binary Message Format Using XML to Provide Hydrographic-related Information”, U.S. Hydrographic Conference (US HYDRO). The Hydrographic Society of America, Norfolk, VA, 2007. B. M. Sullivan, “Visualization of Nautical Information (VONI) Workshop 2017”, International Hydrographic Organization, Monaco, 2017. S. Robinson, “Ping Once Use many times: NOAA Wilmington NC 2016 Field Season”, 2017 U.S. Hydrographic Conference. p. Galveston, TX, 2017. E. Weidner, Weber, T. C., Mayer, L. A., Jakobsson, M., Chemykh, D., and Semiltov, I., “A Wideband Acoustic Method for Direct Assessment of Bubble-Mediated Methane Flux”, Continental Shelf Research. Elsevier, In Press. V. E. Schmidt, “Underwater Tracking of Humpback Whales with High-frequency Pingers and Acoustic Recording Tags”, 2008. J. H. Miller, Weber, T. C., Tuttle, A., and Potter, D. C., “The dependence of target strength of the northern right whale (Eubalaena glacialis) on the acoustic properties of blubber”, Journal of the Acoustical Society of America, vol. 106. Acoustical Society of America, Melville, NY, USA, pp. 0-2163, 1999. J. H. Miller, Potter, D. C., Weber, T. C., and Felix, J., “The target strength of the northern right whale (Eubalaena glacialis)”, Journal of the Acoustical Society of America, vol. 105. Acoustical Society of America, Melville, NY, USA, pp. 0-992, 1999. C. Ware, Arsenault, R., and Plumlee, M. D., “Visualizing the Underwater Behavior of Humpback Whales”, IEEE Computer Graphics and Application, vol. 26. IEEE, Washington DC, Washington DC, USA, pp. 14-18, 2006. A. K. Stimpert, Wiley, D. N., Au, W. W., Johnson, M. P., and Arsenault, R., “'Megaclicks': Acoustic Click Trains and Buzzes Produced During Night-time Foraging of Humpback Whales (Megaptera Novaeangliae)”, Biology Letters, vol. 3. Royal Society Publishing, pp. 467-470, 2007. E. L. Hazen, Friedlaender, A. S., Thompson, M. A., Ware, C., Weinrich, M. T., Halpin, P. N., and Wiley, D. N., “Fine-scale Prey Aggregations and Foraging Ecology of Humpback Whales (Megaptera Novaeangliae)”, Marine Ecology Progress Series, vol. 395. Inter-Research, Nordbunte, Oldendorf, Germany, pp. 75-89, 2009. A. S. Friedlaender, Hazen, E. L., Nowacek, D. P., Halpin, P. N., Ware, C., Weinrich, M. T., Hurst, T., and Wiley, D. N., “Dirl Changes in Humpback Whale (Megaptera Novaeangliae) Feeding Behavior in Response to Sand Lance (Ammodytes SPP.) Behavior and Distribution”, Marine Ecology Progress Series, vol. 395. Inter-Research, Nordbunte, Oldendorf, Germany, pp. 91-100, 2009. A. K. Stimpert, Wiley, D. N., Shorter, K. A., Barton, K. L., Johnson, M. P., Ware, C., Arsenault, R., Lammers, M. O., and Au, W. W., “A Novel Sound Recorded in Association with Bottom Feeding in Humpback Whales”, Biennial Conference on the Biology of Marine Mammals (CBMM). San Diego, CA, USA, pp. 0-0, 2005. D. N. Wiley, Ware, C., Barton, K. L., Shorter, K. A., Johnson, M. P., Arsenault, R., Moller, J. C., and Weinrich, M. T., “Underwater behavior of humpback whales in a western North Atlantic foraging area”, Biennial Conference on the Biology of Marine Mammals (CBMM). San Diego, CA, USA, 2005. V. E. Schmidt, Weber, T. C., Ware, C., Arsenault, R., Wiley, D. N., Johnson, M. P., Dawe, E., and Friedlaender, A. S., “Whale tracking underwater: high frequency acoustic pingers and the instrumented tag (DTAG)”, Acoustical Society of America (ASA). New Orleans, LA, USA, pp. 0-0, 2007. P. A. McGillivary, Schwehr, K., Curcio, J., Hine, E., Terrill, S., Wiggins, E., Roth, E. H., and Fall, K., “Marine Technology Advances to Reduce Incidence of Whale Ship Strikes”, IEEE Oceans. Kobe, Kobe, Japan, 2008. 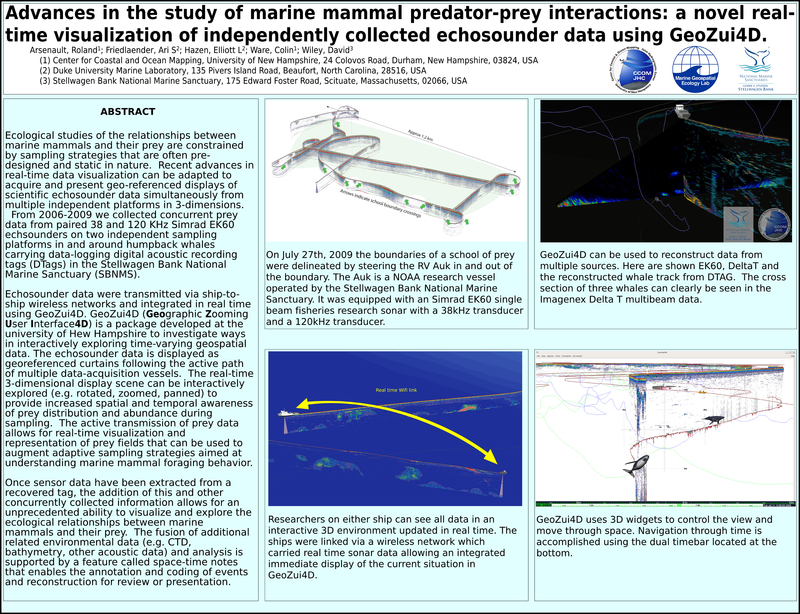 R. Arsenault, Friedlaender, A. S., Hazen, E. L., Ware, C., and Wiley, D. N., “Advances in the study of marine mammal predator-prey interactions: a novel real-time visualization of independently collected echosounder data using GeoZui4D”, Society for Marine Mammalogy. Quebec City, Quebec, Canada, 2009. E. L. Hazen, Friedlaender, A. S., Wiley, D. N., Thompson, M. A., Ware, C., and Weinrich, M. T., “Oceanographic Structuring of Fish Distribution and Fine Scale Foraging of Humpback Whales (Megaptera novaeangliae), Stellwagen Bank Marine Sanctuary”, Society for Marine Mammalogy. Scituate, MA, USA, 2007. E. L. Hazen, Friedlaender, A. S., Wiley, D. N., Thompson, M. A., Ware, C., and Weinrich, M. T., “Three Dimensional Prey Aggregations and Fine Scale Foraging Patterns of Humpback whales (Megaptera novaengliae), Stellwagen Bank Marine Sanctuary”, The International Council for the Exploration of the Sea Annual Science Conference. Heraklion, Crete, Greece, 2007. L. G. Ward, Johnson, P., Nagel, E., McAvoy, Z. S., and Vallee-Anziani, M., “Western Gulf of Maine Bathymetry and Backscatter Synthesis”, Bureau of Ocean Energy Management (BOEM) Marine Minerals Branch, Herndon, VA, 2016. L. G. Ward, McAvoy, Z. S., Masetti, G., and Morrison, R. J., “High Resolution Mapping of Morphologic Features and Seafloor Sediments of the New Hampshire and Vicinity Continental Shelf, Western Gulf of Maine”, Geological Society of America (GSA) Annual Meeting. p. Portland, ME, 2019. E. Sweeney, Gardner, J. V., Johnson, J., and Mayer, L. A., “Geological interpretation of a low-backscatter anomaly found on the New Jersey continental margin”, Marine Geology, vol. 326-328. Elsevier, pp. 46-54, 2012. T. Adams, Beets, P., and Parrish, C. E., “Extracting More Data from LiDAR in Forested Areas by Analyzing Waveform Shape”, Remote Sensing, vol. 4. MDPI Publishing, Basel, Switzerland, pp. 682-702, 2012. G. Masetti, Kelley, J., Johnson, P., and Beaudoin, J., “A Ray-Tracing Uncertainty Estimation Tool for Ocean Mapping”, IEEE Access, vol. 6. IEEE, pp. 2136 - 2144, 2017. G. Lamarche, Le Gonidec, Y., Lucieer, V., Lurton, X., Greinert, J., Dupré, S., Nau, A., Heffron, E., Roche, M., Ladroit, Y., and Urban, P., “In Situ Quantitative Characterisation of the Ocean Water Column Using Acoustic Multibeam Backscatter Data”, 2017 Fall Meeting, American Geophysical Union (AGU). p. New Orleans, LA, 2017. F. Eren, Pe'eri, S., and Rzhanov, Y., “Airborne Lidar Bathymetry (ALB) Waveform Analysis for Bottom Return Characteristics”, SPIE Defense and Commercial Sensing. Baltimore, MD, 2016. J. Humberston, “Estimating Surficial Seafloor Sediment Properties Using an Empirical Orthogonal Decomposition on Acoustic Backscatter Waveform Properties”, University of New Hampshire, Durham, NH, 2015. F. Eren, Pe'eri, S., Rzhanov, Y., and Ward, L. G., “Bottom Characterization by Using Airborne Lidar Bathymetry (ALB) Waveform Features Obtained from Bottom Return Residual Analysis”, Remote Sensing of Environment, vol. 206. Elsevier, pp. 260-274, 2018. R. T. Pack, Brooks, V., Young, J., Vilaça, N., Vatslid, S., Rindle, P., Kurz, S., Parrish, C. E., Craig, R., and Smith, P. W., “An Overview of ALS Technology”, in Airborne Topographic Lidar Manual, Bethesda, Maryland: American Society for Photogrammetry and Remote Sensing (ASPRS), 2012, pp. pp. 7-97. X. Guinda Salsamendi, Gracia, A., Puente, A., Juanes, J. A., Rzhanov, Y., and Mayer, L. A., “Application of landscape mosaics for the biological quality assessment of subtidal macroalgae communities using the CFR index”, Deep Sea Research. 2013. T. C. Weber, Pena, H., and Jech, J. M., “Consecutive Acoustic Observations of an Atlantic Herring School in the Northwest Atlantic”, ICES Journal of Marine Science, vol. 66. Elsevier, New York, NY, USA, pp. 1270-1277, 2009. C. W. Gurshin, Jech, J. M., Howell, W. H., Weber, T. C., and Mayer, L. A., “Measurements of Acoustic Backscatter and Density of Captive Atlantic Cod with Synchronized 300-kHz Multibeam and 120-kHz Split-Beam Echosounders”, ICES Journal of Marine Science, vol. 66. Elsevier, New York, NY, USA, pp. 1303-1309, 2009. T. C. Weber, Bradley, D. L., Culver, R. L., Lyons, A. P., and Adelman, S. G., “Measurements of ambient bubble populations with a multibeam sonar”, Acoustical Society of America (ASA). St. Andrews, New Brunswick, Canada, pp. 0-0, 2002. T. C. Weber, Bradley, D. L., Culver, R. L., and Lyons, A. P., “Laboratory Measurements of the 1st and 2nd Moments of Propagation Through Bubbles in a Flow”, Acoustical Society of America (ASA). Austin, TX, USA, pp. 0-0, 2003. T. C. Weber, Bradley, D. L., Culver, R. L., and Lyons, A. P., “Inferring the Vertical Turbulent Diffusion Coefficient from Backscatter Measurements with a Multibeam Sonar”, Acoustical Society of America (ASA). Austin, TX, USA, pp. 0-0, 2003. S. G. Adelman, Bradley, D. L., Culver, R. L., and Weber, T. C., “Measuring Ambient Ocean Bubble Fields Uusing a Multibeam Sonar”, Acoustical Society of America (ASA). Austin, TX, USA, pp. 0-0, 2003. T. C. Weber, Lyons, A. P., and Bradley, D. L., “The effects of fluctuating spatial structures in bubble clouds on the statistics of acoustic propagation”, International Conference on High-Resolution Survey in Shallow Water (HRSSW). Plymouth, Devon, UK, pp. 0-0, 2004. T. C. Weber, Bradley, D. L., Lyons, A. P., and Bjorno, L., “Acoustic Propagation Through Bubbles: An Exploration of the 1st and 2nd Moments in Various Flow Conditions”, International Conference on Theoretical and Computational Acoustics (ICTCA). Honolulu, HI, USA, pp. 448-469, 2004. T. C. Weber, Lyons, A. P., and Bradley, D. L., “Multibeam sonar observations of hydrodynamic forcing functions and bubble persistence in a ship wake”, Acoustical Society of America (ASA). San Diego, CA, USA, pp. 0-0, 2004. T. C. Weber, Lyons, A. P., and Bradley, D. L., “Concurrent optical and acoustic scattering measurements in bubble clouds”, Underwater Acoustic Measurements: Technologies & Results (UAM). Heraklion, Crete, Greece, pp. 0-0, 2005. R. L. Culver, Weber, T. C., and Bradley, D. L., “The Use of Multibeam Sonars to Image Bubbly Shipwakes”, Underwater Acoustic Measurements: Technologies & Results (UAM). Heraklion, Crete, Greece, pp. 0-0, 2005. T. C. Weber and Pena, H., “Combining Single Frequency Multibeam with Multifrequency Singlebeam Sonars: An Example with Atlantic Herring”, Conference Underwater Acoustic Measurements: Technologies and Results. Crete, Greece, Greece, pp. 0-0, 2007. T. C. Weber, Lyons, A. P., and Bradley, D. L., “Identify Bubble Clustering: Comparisons of the Coherent and Incoherent Fields”, Underwater Acoustic Measurements: Technologies & Results (UAM). Heraklion, Crete, Greece, pp. 0-0, 2007. T. C. Weber, “Multibeam sonar observations of near-surface bubbles during a storm”, Acoustical Society of America (ASA). New Orleans, LA, USA, pp. 0-0, 2007. T. C. Weber, Pena, H., and Jech, J. M., “Multibeam and single-beam sonar observations of Atlantic herring in the Gulf of Maine”, Acoustical Society of America (ASA). New Orleans, LA, USA, pp. 0-0, 2007. J. Beaudoin, “Application of JPEG 2000 Wavelet Compression to Multibeam Echosounder Mid-water Acoustic Refectivity Measurements”, Canadian Hydrographic Conference (CHC). Quebec City, Quebec, Canada, 2010. C. McGonigle, Grabowski, J., Brown, C., Weber, T. C., and Quin, R., “Detection of Deep Water Benthic Macroalgae Using Image-based Classification Techniques on Multibeam Backscatter at Cashes Ledge, Gulf of Maine, USA”, Estuarine, Coastal and Shelf Science, vol. 91. Elsevier, New York, NY, USA, pp. 87-101, 2011. A. R. Norton and Dijkstra, S. J., “Comparing Acoustic- and Aerial Imagery-based Methods of Eelgrass Mapping at Two New England Sites”, Coastal and Estuarine Research Federation Biennial Conference. p. Providence, RI, 2017. L. J. Gee, Raineault, N., Kane, R., Saunders, M., Heffron, E., Embley, R. W., and Merle, S. G., “Seep Detection Using E/V Nautilus Integrated Seafloor Mapping and Remotely Operated Vehicles on the United States West Coast”, 2017 Fall Meeting, American Geophysical Union (AGU). p. New Orleans, LA, 2017. F. Eren, Pe'eri, S., and Thein, M. - W., “Characterization of optical communication in a leader-follower unmanned underwater vehicle formation”, SPIE Defense, Security and Sensing (Ocean remote sensing and monitoring V ), vol. 8724. SPIE, Baltimore, MD, USA, 2013. C. Kastrisios and Tsoulos, L., “A Cohesive Methodology for the Delimitation of Maritime Zones and Boundaries”, Ocean & Coastal Management, vol. 130. Elsevier, pp. 188–195, 2016. C. Kastrisios and Tsoulos, L., “Voronoi Tessellation on the Ellipsoidal Earth for Vector Data”, International Journal of Geographical Information Science. Taylor & Francis, pp. 1-17, 2018. B. R. Calder, Dijkstra, S. J., Hoy, S., Himschoot, K., and Schofield, A., “Design of a Trusted Community Bathymetry System”, 2018 Canadian Hydrographic Conference. Canadian Hydrographic Association, Victoria, BC, Canada, 2018. N. A. Raineault, Smart, C., Mayer, L. A., Ballard, R., Fisher, C. R., Marsh, L., and Shank, T. M., “Signs of Recent Volcanism and Hydrothermal Activity Along the Eastern Segment of the Galapagos Spreading Center”, 2016 Fall Meeting, American Geophysical Union (AGU). American Geophysical Union , San Francisco, CA, p. San Francisco, CA, 2016. J. V. Gardner, Calder, B. R., and Malik, M. A., “Geomorphometry and processes that built Necker Ridge, central North Pacific Ocean”, Marine Geology, vol. 346. Elsevier, pp. 310-325, 2013. J. Miksis-Olds, “Are Manatees Modifying Their Vocalizations to Compensate for Noise?”, Journal of the Acoustical Society of America, 2006. J. Miksis-Olds and Tyack, P. L., “Manatee (Trichechus manatus) Vocalization Usage in Relation to Environmental Noise Levels”, Journal of the Acoustical Society of America, vol. 125. Acoustical Society of America, San Francisco, CA, pp. 1806-1815, 2009. J. Kidd, Pe'eri, S., Eren, F., and Armstrong, A. A., “Performance Evaluation of the Velodyne VLP-16 System for Feature-Surface Surveying”, 2016 Canadian Hydrographic Conference. Canadian Hydrographic Association, Halifax, Nova Scotia, Canada, 2016. T. Butkiewicz, “Multi-touch 3D Exploratory Analysis of Ocean Flow Models”, Proceedings of OCEANS 2011 MTS/IEEE Kona. IEEEE, Kona, HI, USA, 2011. A. H. Stevens and Ware, C., “Visualizing 3D Flow Through Cutting Planes”, IEEE Visualization (VIS). IEEE, Chicago, IL, USA, 2015. T. Butkiewicz and Stevens, A. H., “Effectiveness of Structured Textures on Dynamically Changing Terrain-like Surfaces”, IEEE Visualization (VIS). IEEE, Chicago, IL, USA, 2015. T. Butkiewicz and Stevens, A. H., “Streamlining the Evaluation of Potential Marine Debris Targets for Disaster Response”, IEEE Oceans. IEEE, Washington, DC, USA, 2015. T. Butkiewicz, “Designing Augmented Reality Marine Navigation Aids Using Virtual Reality”, IEEE/MTS Oceans 17. IEEE, Anchorage, AK, 2017. C. Ware, Rogers, D., Petersen, M., Ahrens, J., and Aygar, E., “Optimizing for Visual Cognition in High Performance Scientific Computing”, Electronic Imaging, vol. 2016. Society for Imaging Science and Technology, pp. 1-9, 2016. D. H. F. Pilar, “Visualizing Magnitude and Direction in Flow Fields”, University of New Hampshire, Durham, NH, 2012. A. Šaškov, Dahlgren, T. G., Rzhanov, Y., and Schläppy, M. - L., “Comparison of Manual and Semi-Automatic Underwater Imagery Analysis Approaches for Hard Bottom Benthic Microfauna Monitoring at Offshore Renewable Energy Installations”, Hydrobiologia: The International Journal of Aquatic Sciences, vol. 756, No. 1. Springer, pp. 139–153, 2015. P. J. Etnoyer, Malik, M. A., Sowers, D., Ruby, C., Bassett, R., Dijkstra, J. A., Pawlenko, N., Gottfried, S., Mello, K., Finkbeiner, M., and Sallis, A., “Working with Video to Improve Deep-Sea Habitat Characterization”, Oceanography, vol. 31, No.1, Supplement. The Oceanographic Society, pp. 64-67, 2018. T. C. Weber, De Robertis, A., Greenaway, S. F., Smith, S. M., Mayer, L. A., and Rice, G. A., “Estimating oil concentration and flow rate with calibrated vessel-mounted acoustic echo sounders”, PNAS (Proceedings of the National Academy of Sciences of the United States of America), vol. 108. 2011. T. C. Lippmann, “Subtidal Flow Structure in Tidally Modulated Inlets”, Coastal Dynamics 2013, vol. 1. ASCE, Plymouth, England, United Kingdom, 2013. T. C. Lippmann, Irish, J. D., and Hunt, J., “Observations of the Vertical Structure of Tidal Currents in Two Inlets”, Journal of Coastal Research, vol. 65, Special Issue. pp. 2029-2034, 2013. N. C. Wardwell, “Offshore Vertical Datum Separations Derived from Post-Processed Kinematic (PPK) Heights Observed Along a Scheduled Ferry Route”, University of New Hampshire, Durham, NH, 2008. R. S. Hawkins, Miksis-Olds, J., and Smith, C. M., “Variation in Low-Frequency Estimates of Sound Levels Based on Different Units of Analysis”, Journal of the Acoustical Society of America, vol. 135. Acoustical Society of America, pp. 705-711, 2014. J. A. Dijkstra and Simkanin, C., “Intraspecific Response of Colonial Ascidians to Variable Salinity Stress in an Era of Global Change”, Marine Ecology Progress Series, vol. 551. Inter-Research, Oldendorf/Luhe, Germany , pp. 215-225, 2016. B. Lamey, Riley, J., Froelich, G., Miller, J., and Calder, B. R., “Variable Resolution Bathymetric-Gridding Technology for Nautical Charting: Case Study CHRT Data”, U.S. Hydrographic Conference (US HYDRO). The Hydrographic Society of America, New Orleans, LA, USA, 2013. B. R. Calder, “Distribution-free, Variable Resolution Depth Estimation with Composite Uncertainty”, U.S. Hydrographic Conference (US HYDRO). The Hydrographic Society of America, New Orleans, LA, USA, 2013. F. Eren, Pe'eri, S., Rzhanov, Y., Thein, M. - W., and Celikkol, B., “Pose Detection and control of multiple unmanned underwater vehicles using optical feedback”, Oceans '14 MTS/IEEE. Taipei, Tawian, 2014. F. Eren, Pe'eri, S., Rzhanov, Y., Thein, M. - W., and Celikkol, B., “Detector Array Design for Optical Communication Between Unmanned Underwater Vehicles (UUVs)”, IEEE Journal of Oceanic Engineering, vol. 40(1). IEEE Oceanic Engineering Society, pp. 18-26, 2016. S. E. Beaulieu, Fox, P. A., Di Stefano, M., Maffei, A., West, P., Hare, J. A., and Fogarty, M., “Toward cyberinfrastructure to facilitate collaboration and reproducibility for marine integrated ecosystem assessments”, Earth Science Informatics, vol. 10. Springer, p. 13, 2016. J. Wozencraft, Aslaksen, M., Imahori, G., Pe'eri, S., and Witmer, J., “Using JALBTCX - USACE Airborne Topographic-Bathymetric Lidar to Update Coastal Bathymetry on NOAA Nautical Charts”, 2016 Canadian Hydrographic Conference. Halifax, Nova Scotia, Canada, 2016. J. V. Gardner, Armstrong, A. A., and Calder, B. R., “Hatteras Transverse Canyon, Hatteras Outer Ridge and Environs of the U.S. Atlantic Margin: A View from Multibeam Bathymetry and Backscatter”, Marine Geology, vol. 371. Elsevier, pp. 18-32, 2015. V. E. Schmidt, “Autonomous Navigation on US (Electronic) Nautical Charts”, 2018 Canadian Hydrographic Conference. Canadian Hydrographic Society, Victoria, CA, 2018. E. H. Roth, Schmidt, V. E., Hildebrand, J. A., and Wiggins, S. M., “Underwater radiated noise levels of a research icebreaker in the central Arctic Ocean”, The Journal of the Acoustical Society of America, vol. 133, pp. 1971–1980, 2013. M. Birkebak, “Airborne Lidar Bathymetry Beam Diagnostics Using an Underwater Optical Detector Array”, University of New Hampshire, Durham, NH, 2017. 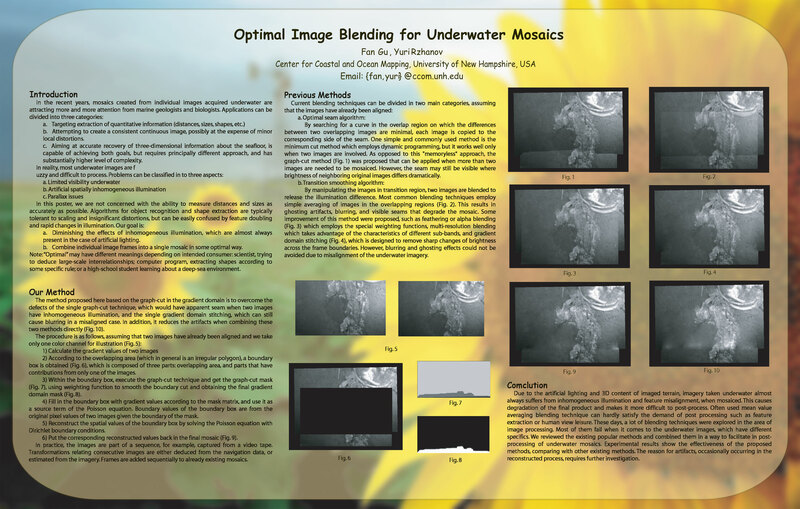 F. Gu and Rzhanov, Y., “Optimal Image Blending for Underwater Mosaics”, Oceans 2006. IEEE, Boston, MA, 2006. S. Randeni, “Parameter identification of a nonlinear model: replicating the motion response of an autonomous underwater vehicle for dynamic environments”, Nonlinear Dynamics. Springer Netherlands, pp. 1-19, 2017. Y. Rzhanov, Pe'eri, S., and Shashkov, A., “Probabilistic Reconstruction of Color for Species' Classification Underwater”, IEEE/MTS Oceans '15. Genova, Italy, p. Genova, Italy, 2015. A. Šaškov and Rzhanov, Y., “Video mozaikos metodo panaudojimas povandeniniams tyrimams”, National Lithuanian 5th conference "Juros ir krantu tyrimai - 2011" (Sea and shore researches - 2011). Palanga, LTU, 2011. H. Hu, “Euclidean Reconstruction of Natural Underwater Scenes Using Optic Imagery Sequence”, University of New Hampshire, Durham, NH, 2015. S. Pe'eri, Eren, F., Thein, M. - W., Rzhanov, Y., and Birkebak, M., “Underwater-Detector Array for Optical Communication and Laser Beam Diagnostics”, SPIE Defense + Commercial Sensing. Baltimore, MD, 2016. G. Masetti, Mayer, L. A., and Ward, L. G., “A Bathymetry- and Reflectivity-Based Approach for Seafloor Segmentation”, Geosciences, vol. 8 (1). MDPI Publishing, Basel, Switzerland, p. 14, 2018. L. L. Whitcomb, Bowen, A., Yoerger, D., German, C. R., Kinsey, J., Mayer, L. A., Jakuba, M., Gomez-Ibanez, D., Taylor, C., Machado, C., Howland, J., Kaiser, C. L., Heintz, M., Pontbriand, C., Suman, S., and O'hara, L., “Design and Fabrication of Nereid-UI: A Remotely Operated Underwater Vehicle for Oceanographic Access Under Ice”, 2013 Fall Meeting, American Geophysical Union (AGU). San Francisco, CA, 2013. J. V. Gardner, Mayer, L. A., and Armstrong, A. A., “From the Arctic to the tropics: The U.S. UNCLOS bathymetryic mapping program.”, Canadian Hydrographic Conference (CHC). 2008. L. A. Mayer, “U.S. Law of the Sea Cruise to Map the Foot of the Slope and 2500-m Isobath of the U.S. Arctic Ocean Margin, Barrow to Barrow. Cruise Report”, University of New Hampshire (UNH), Center for Coastal and Ocean Mapping (CCOM)/Joint Hydrographic Center (JHC), 2003. L. A. Mayer and Armstrong, A. A., “U.S. Law of the Sea Cruise to Map and Sample the US Arctic Ocean Margin”, University of New Hampshire (UNH), Center for Coastal and Ocean Mapping (CCOM)/Joint Hydrographic Center (JHC), 2012. B. R. Calder, “Use (and Potential Abuse) of Uncertainty in Hydrography”, 6th International Conference on High-Resolution Survey in Shallow Water. Wellington, New Zealand, 2012. V. E. Schmidt, Weber, T. C., and Lurton, X., “Optimizing Resolution and Uncertainty in Bathymetric Sonar Systems”, Conference Underwater Acoustic Measurements: Technologies and Results. Corfu, Greece, 2013. J. N. Rogers, Parrish, C. E., Ward, L. G., and Burdick, D. M., “Assessment of Elevation Uncertainty in Salt Marsh Environments Using Discrete-Return and Full-Waveform Lidar”, Journal of Coastal Research, vol. SI 76. Coastal Education & Research Foundation [CERF], Coconut Creek, FL, pp. 107-122, 2016. C. E. Parrish, Eren, F., Jung, J., Imahori, G., and White, S. A., “Total Propagated Uncertainty Analysis for Topobathymetric Lidar”, 18th Annual JALBTCX Airborne Coastal Mapping and Charting Workshop. Savannah, GA, p. Savannah, GA, 2017. F. Eren, Pe'eri, S., and Weston, N., “Relationship Between Depth Measurement Uncertainty and Seafloor Characteristics in Airborne Lidar Bathymetry Systems”, 2017 U.S. Hydrographic Conference. Galveston, TX, p. Galveston, TX, 2017. J. S. Byrne and Schmidt, V. E., “Uncertainty Modeling for AUV Acquired Bathymetry”, U.S. Hydrographic Conference (US HYDRO). Gaylord Hotel, National Harbor, Maryland U.S.A., 2015. L. Cocchi, Masetti, G., Muccini, F., and Carmisciano, C., “Geophysical Mapping of Vercelli Seamount: Implications for Miocene Evolution of the Tyrrhenian Back Arc Basin”, Geoscience Frontiers. ScienceDirect, 2015. P. Johnson and Jerram, K., “RVIB Nathaniel B. Palmer: EM122 Multibeam Echosounder Sea Acceptance Trial for TX/RX Arrays, NBP1505, June 10-15, 2015”, Center for Coastal and Ocean Mapping / Joint Hydrographic Center, Durham, NH, 2015. B. O'Brien, Mello, K., Litterer, A., and Dijkstra, J. A., “Seaweed Structure Shapes Trophic Interactions: A Case Study Using a Mid-Trophic Level Fish Species”, Journal of Experimental Marine Biology and Ecology, vol. 506. Elsevier, pp. 1-8, 2018. J. L. Hizzett, Clarke, J. E. Hughes, Sumner, E. J., Cartigny, M. J. B., Talling, P. J., and Clare, M. A., “Which Triggers Produce the Most Erosive, Frequent, and Longest Runout Turbidity Currents on Deltas?”, Geophysical Research Letters, vol. 45,2. American Geophysical Union , pp. 855-863, 2018. D. C. Mosher, Campbell, D. C., Gardner, J. V., Chaytor, J. D., and Rebesco, M., “The Role of Deep-Water Sedimentary Processes in Shaping a Continental Margin: The Northwest Atlantic”, Marine Geology, vol. 393. Elsevier, pp. 245-259, 2017. G. Masetti, Faulkes, T., and Kastrisios, C., “Automated Identification of Discrepancies Between Nautical Charts and Survey Soundings”, ISPRS International Journal of Geo-Information, vol. 7. MDPI Publishing, Basel, Switzerland, p. 392, 2018. J. N. Rogers, Parrish, C. E., Ward, L. G., and Burdick, D. M., “Improving Salt Marsh Digital Elevation Model Accuracy with Full-Waveform Lldar and Nonparametric Predictive Modeling”, Estuarine, Coastal and Shelf Science, vol. 202. Elsevier, pp. 193-211, 2018. J. Miksis-Olds and Miller, J. H., “Transmission Loss in Manatee Habitats”, Journal of the Acoustical Society of America, vol. 120. Acoustical Society of America, San Francisco, CA, pp. 2320-2327, 2006. M. L. Wolfson-Schwehr, “The Relationship Between Oceanic Transform Fault Segmentation, Seismicity, and Thermal Structure”, University of New Hampshire, Durham, NH, 2015. M. L. Wolfson-Schwehr, Boettcher, M. S., McGuire, J. J., and Collins, J. A., “The Relationship Between Seismicity and Fault Structure on the Discovery Transform Fault, East Pacific Rise”, Geochemistry, Geophysics, Geosystems, vol. 15. pp. 3698–3712, 2014. R. Wigley, Zarayskaya, Y., Bazhenova, E., Falconer, R., and Zwolak, K., “Nippon Foundation / GEBCO Ocean Mapping Training Program at the University of New Hampshire: 13 Years of Success and Alumni Activities”, OCEANS 2017. IEEE, Aberdeen, UK, 2017. J. A. Dijkstra, Buckman, K. L., Ward, D., Evans, D. W., Dionne, M., and Chen, C. Y., “Experimental and natural warming elevates mercury concentrations in estuarine fish”, PLoS ONE, vol. 8. p. e58401, 2013. G. Imahori, Ferguson, J., Wozumi, T., Scharff, D., Pe'eri, S., Parrish, C. E., White, S. A., Jeong, I., Sellars, J., and Aslaksen, M., “A procedure for developing an acceptance test for airborne bathymetric lidar data application to NOAA charts in shallow waters”, National Oceanic and Atmospheric Administration (NOAA), National Ocean Survey (NOS), Silver Spring, MD, 2013. J. Kinney, Wolfskehl, S., Bruce, S., Bogonko, M., Bongiovanni, C., Armstrong, A. A., Nagel, E., Pe'eri, S., and Parrish, C. E., “Update on NOAA's IOCM Sandy Project for Charting and Habitat Mapping Using Topobathymetric Lidar Surveys”, 16th Annual JALBTCX Airborne Coastal Mapping and Charting Workshop. Corvallis, OR, 2015. J. Miksis-Olds and Nichols, S. M., “Is Low Frequency Ocean Sound Increasing Globally?”, Journal of the Acoustical Society of America, vol. 139. Acoustical Society of America, pp. 501-511, 2016. S. Denney, “A Tidal Study of Great Bay, New Hampshire”, University of New Hampshire, Durham, NH, 2012. C. Borba, “Integration of Tide/Water Level Information into ECDIS for Guanabara Bay”, University of New Hampshire, Durham, NH, 2015. G. Lucking, Stark, N., Lippmann, T., and Smyth, S., “Variability of in situ Sediment Strength and Pore Pressure Behavior of Tidal Estuary Surface Sediments”, Geo-Marine Letters, vol. 37, 5. Springer, pp. 441-456, 2017. M. Wosnick, Rowell, M., Dewhurst, T., Lyon, V., Lippmann, T., Baldwin, K., and Swift, R., “Description of an intermediate scale tidal energy test site in Great Bay Estuary, NH, with examples of technology deployments”, IEEE Oceans '14. Marine Technology Society, St. Johns, Newfoundland, CA, pp. 1-7, 2014. A. R. Norton and Dijkstra, S. J., “Observations of Acoustic Backscatter and Current Velocity Above an Eelgrass Canopy Over Multiple Tidal Cycles”, New England Estuarine Research Society Fall Meeting. p. Block Island, RI, 2016. D. V. Holliday, Donaghay, P. L., Greenlaw, C. F., McGehee, D. E., McManus, M. M., Sullivan, J. M., and Miksis-Olds, J., “Advances in Defining Fine- and Micro-Scale Pattern in Marine Plankton”, Aquatic Living Resources, vol. 16. Cambridge, pp. 131-136, 2003. C. Lanzoni, “Field Calibration Methodology for a Multibeam Echo Sounder Using a Split Beam Sonar System and a Standard Target”, University of New Hampshire, Durham, NH, 2011. J. A. Dijkstra, Westerman, E. L., and Harris, L. G., “Elevated Seasonal Temperatures Eliminate Thermal Barriers of Reproduction of a Dominant Invasive Species: A Community State Change for Northern Communities?”, Diversity and Distributions, vol. 23. Wiley, pp. 1082-1092, 2017. K. Schwehr, Armstrong, A. A., Brennan, R. T., Fischman, D., Sellars, J., and Smith, S. M., “Bathymetric Attributed Grids (BAGs): Discovery of Marine Datasets and Geospatial Metadata Visualization”, Canadian Hydrographic Conference (CHC). Quebec City, Quebec, Canada, 2010. C. Kastrisios and Tsoulos, L., “An Integrated GIS Methodology for the Determination and Delineation οf Juridical Bays”, Ocean & Coastal Management, vol. 122. Elsevier, pp. 30-36, 2016. C. Kastrisios, “Graphical Methods of Maritime Outer Limits Delimitation”, Nausivios Chora, vol. 4. Hellenic Naval Academy, Piraeus, Greece, pp. E3 - E22, 2015. C. Kastrisios and Tsoulos, L., “Maritime Zones Delimitation Problems and Solutions”, International Cartographic Conference (ICC), vol. 1. International Cartographic Association (ICA), Washington, DC, 2017. J. A. Dijkstra, Litterer, A. S., Mello, K., Rzhanov, Y., and Johnson, P., “A Fish Eyes View of the Impact of Non-native Seaweeds on Temperate Reef Seascapes”, Benthic Ecology Meeting. Portland, ME, 2016. M. Jakobsson, Mayer, L. A., and Monahan, D., “Arctic Ocean Bathymetry: A Necessary Geospatial Framework”, ARCTIC, vol. 68, No. 5. Arctic Institute of North America, Calgary, Canada, pp. 41-47, 2015. G. Masetti and Calder, B. R., “Development of an adaptive fusion algorithm for marine debris recognition within the post-Sandy restoration framework”, Canadian Hydrographic Conference 2014. St. John's, NL, Canada, 2014. G. Masetti and Calder, B. R., “A Bayesian marine debris detector using existing hydrographic data products”, IEEE Oceans. IEEE, Genoa, Italy, 2015. G. Masetti, Calder, B. R., and Wilson, M., “A Marine Object Manager for Detected and Database-stored Features”, Shallow Survey 2015. Plymouth, UK, 2015. R. E. Hansen, Lyons, A. P., Sæbø, T. O., Callow, H. J., and Cook, D. A., “The Effect of Internal Wave-Related Features on Synthetic Aperture Sonar”, IEEE Journal of Oceanic Engineering, vol. 40, No. 3. IEEE, pp. 621-631, 2015. S. M. Steele and Lyons, A. P., “An Experimental Test of End-Fire Synthetic Aperture Sonar for Sediment Acoustics Studies”, 176th Meeting Acoustical Society of America. p. Victoria, BC, Canada, 2018. S. M. Steele and Lyons, A. P., “End-fire Synthetic Aperture Sonar for Seafloor Volume Scattering Studies”, The Journal of the Acoustical Society of America, p. Minneapolis Minnesota, 2018. C. Ware, “Alternating Asymmetric Swimming Strokes in California Sea Lions”, 21st Biennial Conference on the Biology of Marine Mammals. Society for Marine Mammalogy, San Francisco, CA, 2015. M. Jakobsson, O'Regan, M. A., Kirchner, N., Ananiev, R., Bachman, J., Barrientos, N., Chernykh, D., Coxall, H., Cronin, T., Koshurnikov, A., Lobkovsky, L., Mayer, L. A., Noormets, R., Muschitiello, F., Nilsson, J., Pearce, C., Semiltov, I., and Stranne, C., “On the Existence of an East-Siberian-Chukchi Ice Sheet: New Insights from the SWERUS-C3 Expedition 2014”, 2015 Fall Meeting, American Geophysical Union (AGU). San Francisco, CA, 2015. J. E. Hughes Clarke, “The Impact of Acoustic Imaging Geometry on the Fidelity of Seabed Bathymetric Models”, Geosciences, vol. 8,4. MDPI, 2018. M. J. Wilson, Masetti, G., and Calder, B. R., “Finding Fliers: New Techniques and Metrics”, 2017 U.S. Hydrographic Conference. The Hydrographic Society of America, Galveston, TX, 2017. B. Gallagher, Masetti, G., Zhang, C., Calder, B. R., and Wilson, M. J., “Sound Speed Manager: An Open-Source Initiative to Streamline the Hydrographic Data Acquisition Workflow”, U.S. Hydro Conference 2017. The Hydrographic Society of America, Galveston, TX, 2017. G. Masetti, Gallagher, B., Calder, B. R., Zhang, C., and Wilson, M. J., “Sound Speed Manager: An Open-Source Application to Manage Sound Speed Profiles”, International Hydrographic Review, vol. 17. International Hydrographic Bureau, Monaco, pp. 31-40, 2017. K. Baldwin, Mosher, D. C., and Gebhardt, C., “Surficial Geology Mapping of the Arctic Ocean: Using Subbottom Profiling and Multibeam Echosounding Data Sets to Constrain the Subsea North of 64° as a Layer for the IBCAO”, 2016 Fall Meeting, American Geophysical Union. p. San Francisco, CA, 2016. L. G. Ward, Vallee-Anziani, M., and McAvoy, Z. S., “New Hampshire and Vicinity Continental Shelf: Morphologic Features and Surficial Sediments”, Bureau of Ocean Energy Management (BOEM) Marine Minerals Branch, Herndon, VA, 2016. S. Chopakatla, Lippmann, T., and Richardson, J., “Field verification of a CFD model for wave transformation and breaking in the surf zone”, Journal of Waterways Port Coastal Engineering, vol. 134 (2). ASCE, pp. 71-80, 2008. A. Chase, Dijkstra, J. A., and Harris, L. G., “The Influence of Substrate Material on Ascidian Larval Settlement”, Marine Pollution Bulletin, vol. 106. Elsevier, pp. 35-42, 2016. Y. Rzhanov, “Photo-mosaicking of images of pipe inner surface”, Signal, Image and Video Processing. Springer Science+Business Media B.V., London, UK, pp. 1-7, 2011. R. C. Connor, Heithaus, M. R., Berggren, P., and Miksis-Olds, J., “"Kerplunking": Surface Fluke-Splashes During Shallow-Water Bottom Foraging by Bottlenose Dolphins”, Marine Mammal Science, vol. 16 (3). Wiley-Blackwell, pp. 646-653, 2000. B. M. Sullivan, “S-111 and S-126: Surface Currents and the Physical Environment a Test Case”, International Hydrographic Organization, Monaco, 2017. J. Kinney, Bogonko, M., White, M., Nagel, E., Dijkstra, J. A., Parrish, C., Wilson, N., and Armstrong, A. A., “Intensity and Reflectance Mapping for Habitat Mapping and Seafloor Characterization Using the Superstorm Sandy Lidar Data”, JALBTCX. Silver Spring, MD, 2016. M. Bogonko, Kinney, J., Wolfskehl, S., Armstrong, A. A., White, M., and Bruce, S., “GIS Application to Post Super Storm Sandy Marine Debris Assessment and Categorization”, ESRI Ocean GIS Forum. p. Redlands, CA, 2016. A. Trembanis, Duval, C., Beaudoin, J., Schmidt, V. E., Miller, D., and Mayer, L. A., “A detailed seabed signature from Hurricane Sandy revealed in bedforms and scour”, Geochemistry, Geophysics, Geosystems, vol. 14. AGU, pp. 4334–4340, 2013. S. Loranger and Weber, T. C., “Detection and Quantification of Submerged Oil Droplets by a Broadband, High-frequency Echo Sounder”, 2016 Gulf of Mexico Oil Spill and Ecosystem Science Conference. p. Tampa, FL, 2016. S. Loranger and Weber, T. C., “Diameter and Density Dependent Target Strength of Submerged Oil Droplets Measured by a Broadband, High-frequency Echo Sounder”, 169th Meeting of the Acoustical Society of America. p. Pittsburgh, PA, 2015. M. Jakobsson, Hogan, K., Mayer, L. A., Mix, A. C., Jerram, K., Mohammad, R., Stranne, C., and Eriksson, B., “The History of Retreat Dynamics of Petermann Glacier Inferred from Submarine Glacial Landforms”, 2016 Fall Meeting, American Geological Society (AGU). p. San Francisco, CA, 2016. A. A. Armstrong, Mayer, L. A., and Gardner, J. V., “Seamounts, Submarine Channels, and New Discoveries”, Journal of Ocean Technology, vol. 10, No. 3. Fisheries and Marine Institute of Memorial University of Newfoundland, St. John's, Newfoundland, Canada, pp. 1-14, 2015. L. A. Mayer, Gardner, J. V., and Armstrong, A. A., “An Ultrahigh-Latitude Submarine Channel: Northern Chukchi Rise”, in Atlas of Submarine Glacial Landforms: Modern, Quaternary and Ancient., vol. Memoirs, London, UK: The Geological Society of London, 2016, pp. 391-392. Y. - T. Lin, Duda, T. F., Emerson, C., Gawarkiewicz, G. G., Newhall, A. E., Calder, B. R., Lynch, J. F., Abbot, P., Yang, Y. - J., and Jan, S., “Experimental and Numerical Studies of Sound Propagation over a Submarine Canyon Northeast of Taiwan”, IEEE Journal of Oceanic Engineering, vol. 40(1). IEEE, pp. 237-249, 2015. C. Fandel, Lippmann, T. C., and Irish, J. D., “Observation of Flow Structure Around Pockmarks in Belfast Bay, Maine”, TOS/ASLO/AGU Ocean Sciences. Salt Lake City, UT, 2012. G. Masetti, Mayer, L. A., Ward, L. G., and Sowers, D., “Bathymetric and Reflectivity-derived Data Fusion for Preliminary Seafloor Segmentation and Strategic Bottom Sampling”, GeoHab 2018. p. Santa Barbara, CA, 2018. This website and its content are the copyright of the University of New Hampshire.